If you can get loaded pretty quickly on Monday, you can run hard and deliver Tuesday morning. Can you do it legally by the logbook? I very much doubt it. But I'm not telling you what to do. I'm giving you the information so you can decide how to run your own career. Let's assume you want to make all of the money you can just for fun. You pull into the shipper at 9:00 a.m. and you're going to try to get them to load you early. Remember what I said earlier: the best chance you have for someone to do you a favor is if they WANT to do you a favor. So with this in mind you approach the shipping department. What I always do is explain my situation honestly(or with a bit of exaggeration as insurance). I tell them, “I know my appointment isn't until 11:00 but I came in early hoping I could get loaded a bit early. If I can get this load delivered tomorrow instead of Wednesday, my dispatcher has me set up on a load that ships around noon on Tuesday. Remember what I said earlier: the best chance you have for someone to do you a favor is if they WANT to do you a favor. Simple enough, right? You wouldn't believe how many drivers, even experienced drivers, go storming into a place demanding immediate service, threatening to leave the place and not take the load, and insulting the dockworkers for being slow, lazy, and uncaring if they won't load them early. What, are you kidding me? Do you really think you can get any kind of results that way? You're gonna sit out there in that parking lot and ROT if they can get away with it, and some places CAN. But why on Earth would they want to help you out? You're a JERK! And you're not their boss. Very, very few people understand or appreciate truck drivers and how difficult our jobs are. Honestly, a lot of people care more about the color of Mr Roger's sweater. Your best chance of getting them to help you out is to help them understand your situation and treat them with respect. Be the type of person they enjoy being around and maybe, just maybe they'll want to help you out. That's the best you can hope for. It won't always work, but more times than not it will. For quite a number of years I ran regional routes. I'd be out five days and home two on average. If you get a scenario like the one I just went through and you can get loaded and make the delivery early, it can be a huge, huge difference in your pay that week. You may get 2800 miles that week if you can get a couple of places to load or unload you early. You may only get 1700 if you can't. At, say, thirty eight cents per mile you're talking a difference of $418 THAT WEEK! That's as much as the total paycheck for a lot of people each week! Now multiply that by about 50 working weeks per year and you can see what a gigantic amount of extra money we're talking about here. It's huge! 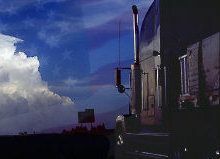 Very, very few people understand or appreciate truck drivers and how difficult our jobs are. So if you feel you can get loaded in time to deliver early, immediately call the consignee (that's the ridiculous word they use for the place you're delivering) and give them the same exact story. I'd say 80%-90% of the time the customers will be glad to get their shipment early. Some won't be able to take it early because they don't have the storage space or they already have too many trucks scheduled on the day you wanted to deliver, but usually they'll take their freight as soon as you can get it to ‘em.